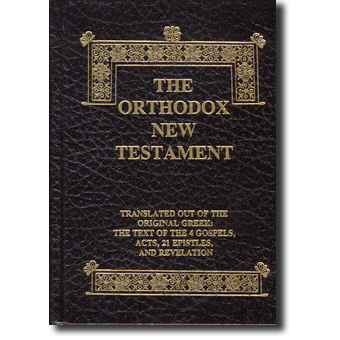 The Orthodox New Testament — Now Available in Digital Formats !!! We are happy to announce that The Orthodox New Testament, which includes all the text from the Gospel of Saint Matthew through Revelation (without the end notes that our larger printed versions contain), is Now Available as an eBook. The text of this eBook is searchable. Font sizes and type can usually be changed to suit your needs. Those features, and others, will vary depending on the reader that you use on your device, whether it be a computer or a mobile device. ePub for your Apple iPad, Apple iPhone, Nook, Sony Reader, Laptop or Desktop. MobiPocket for your Kindle or Kindle DX. PDF eBook for your Apple iPad, Apple iPhone, Nook, Sony Reader, Laptop or Desktop. Keep in mind the following: ePub and Mobi eBooks will automatically adjust to fit your screen. These eBooks do not include page numbers, and the text reflows as the reader increases or decreases the font size. ePubs can be read on an eReader, your computer, or on an iOS or Android device using Adobe Digital Editions or other software you choose. Mobi eBooks can be downloaded and read on your Kindle device or by using the Kindle Previewer application on a computer. Please ensure you purchase the correct format for your best viewing experience. The ShelfWise site has more information about the various eBook formats, because the eBook format you choose must be compatible with your device or the software you wish to use. Once the purchase is transacted on ShelfWise, the cost is non-refundable, whether in part or its entirety. This eBook is being hosted on ShelfWise, which is our publisher’s Online Digital Book Store. Though it is separate from our monasteries’ websites, yet the ShelfWise website provides robust technical support if needed. Please ensure that you do not have “Pop Ups” blocked, as this will open in a new page. If there are any technical support questions, we urge our eBook readers to consult solely with ShelfWise, which provides a thorough “eBook Info” page.